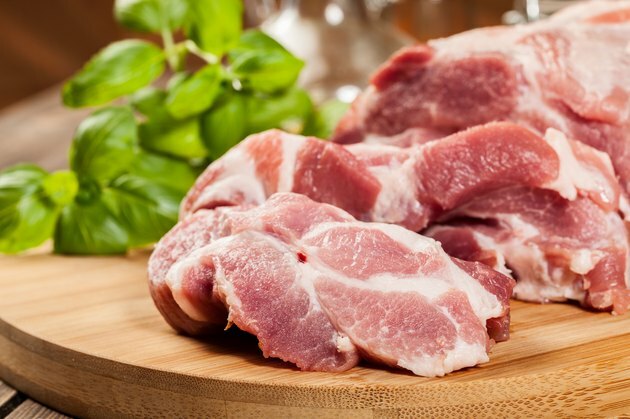 Pork is a healthy source of protein, iron and zinc, but must be cooked properly to avoid illness. According to the United States Department of Agriculture Food Safety and Inspection Service, pork should be cooked to an internal temperature of 145 degrees Fahrenheit to kill the germs, bacteria and parasites that can lead to most food-borne illnesses. Once you know more about the diseases pork can cause, you can take the steps necessary to protect yourself. Salmonella is caused by eating food contaminated with animal feces. Symptoms of salmonella generally occur within the first 12 to 72 hours after infection. Salmonella causes fever, diarrhea and abdominal cramps and usually lasts for about one week. In most cases, infected individuals recover without treatment, though it may take several weeks before your bowel habits return to normal. In more severe cases, the infection can move into the bloodstream, which can cause death if not treated immediately. Antibiotics are not usually effective unless the infection spreads out of the intestines. Pigs can transfer E.coli to humans, though they do not usually get sick themselves. E.coli causes severe abdominal cramps, vomiting and diarrhea, which can be bloody. A mild fever might also be present with an E.coli infection. Many cases of E.coli are mild and go away on their own. In more serious cases, E.coli can cause hemolytic uremic syndrome, or HUS. HUS can be life-threatening and causes decreased urination, fatigue and changes in skin color on the cheeks and around the eyes. E.coli does not respond to antibiotics. Pork that is infected with the larva of a worm called Trichinella can cause trichinellosis. The first symptoms of trichinellosis include nausea, vomiting, diarrhea, fatigue, fever and abdominal pain. Later an infected person can develop headache, joint pain, muscle pain, cough, eye swelling and constipation. It can take several months for the symptoms of trichinellosis to disappear completely. Severe cases can cause heart and breathing problems or death. Antibiotics are usually necessary to treat trichinellosis. Listeriosis is caused by the Listeria monocytogenes bacteria, and most commonly affects pregnant women, older adults, babies and individuals with weak immune systems. Gastrointestinal symptoms, such as diarrhea, are often the first sign of an infection, but an infected person might also experience fever and muscle aches. Infections that occur in pregnant women can cause miscarriage, stillbirth or premature delivery. Listeriosis is treated with antibiotics. Staphylococcus aureus is perhaps one of the most dangerous illnesses that humans can get from eating pork because it cannot be destroyed through the cooking process. Sliced meat, such as ham, is a common source of Staphylococcus aureus. Symptoms can begin within 30 minutes after eating contaminated pork, and include nausea, vomiting, abdominal cramps and diarrhea. The illness is usually mild and goes away on its own within three days. Antibiotics are not effective for treating this illness.